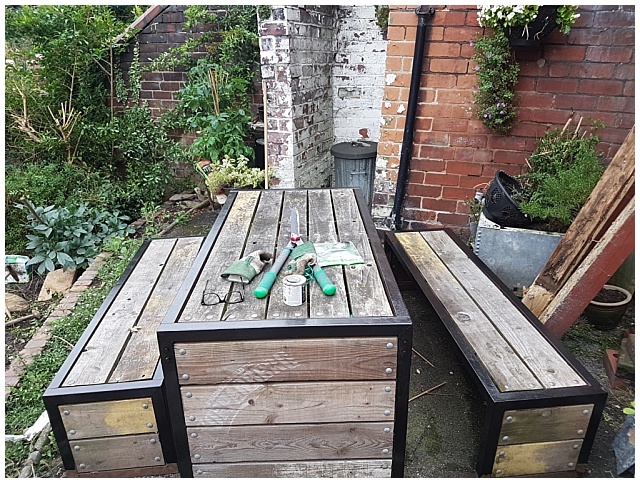 House Update: How I transformed our garden furniture with tester pots! We've been working on the garden quite a lot these last few weeks as we've had a new fence put up to dog proof the garden (there were so many bits that they could have escaped from if they'd wanted to.) We’ve dug up trees and bushes, we’ve cleared weeds and shrubs, we’ve un-earthed a lot more space that needs to be grassed over. 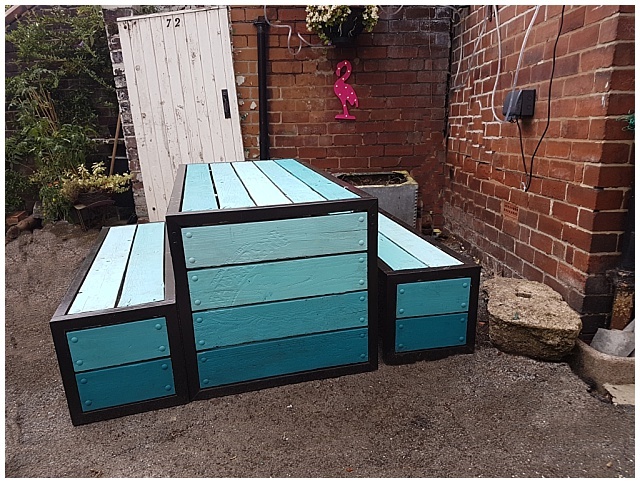 And whilst the garden area isn't quite totally done, one of the projects that I have completed is ready to show you - our garden furniture makeover. 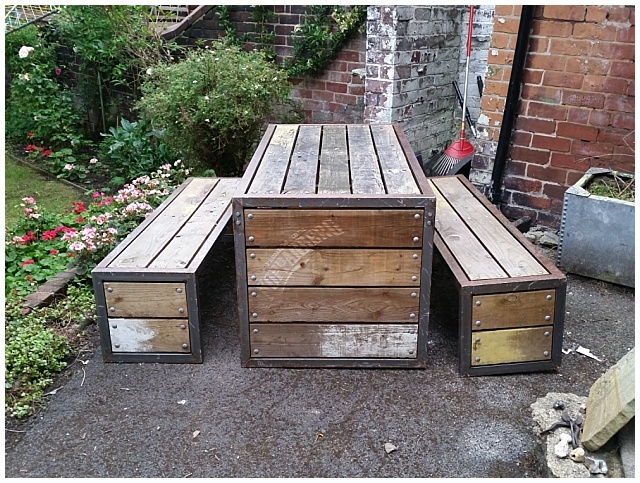 And it was so simple to do - if you're looking for a garden furniture makeover, look no further. Our garden furniture was a freebie from one of the bars I used to work for (hence the Kopparburg branding on the side) so it wasn't new when we got it but as they were updating their outside furniture and we’d just bought a house it seemed like was perfect timing (plus, have you seen how much garden furniture costs!). But this will be the 3rd year of the set sitting out in the garden and the weather was starting to take its toll as we’ve not had it covered or protected in any way. The wood was starting to age and the metal edge of the table was rusted to the point it left dirty marks on your jeans. Not ideal. So I started to look around for a solution. After a bit of Googling I found out about a product called ‘Hammerite paint to rusted metal’ paint which, as the cliché goes – does exactly what it says on the tin – it paints right onto rusted metal, no priming. And being the lazy DIY-er that I am, this is perfect for me so I picked up a can of the Hammered Finish in Black at B&Q for about £9. I ended up doing 2 coats of the paint on the metal work of the table. The tin says it covers 5sq meters. Honestly I have no idea actually what this is in respect to the metal on the garden set but the tin did 2 full covers of the set, with a little bit left over that I painted on random bits of the outhouse. I did one coat on a Friday night when I got home from work (rock and roll). I took the dogs to the park whilst it dried, had a G&T and then did the other coat before the light left me for the day. Before I painted, I did wire brush most of the metal lightly to just get rid of any big bits of rust, but I didn’t do any other prep and 2 coats made the metal look pretty amazing. And I’ve been telling everyone I know about this paint. Who knew it was this easy to get rid of rust? My next job was to sort out the wood area of the furniture. I chatted to Jim about my plans, and his only feedback was that I wasn’t to paint it pink. Obviously before he’d said this my brain was heading straight for a flamingo pink for the set, but I guess he has to use the garden too, so I really ought to pay a bit of attention to him sometimes. Which meant the next stop in my brain was turquoise. 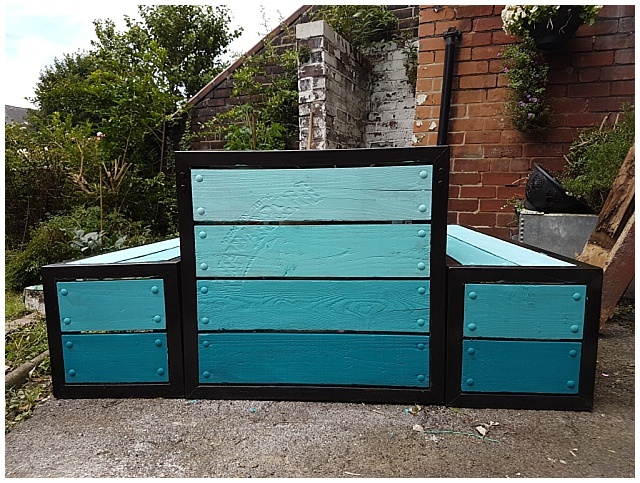 After a visit to the Valspar desk in my local B&Q I chose a shade of turquoise which matched my favourite turquoise ring, called ‘Seize the day’. This paint is one of the shades available as a wood paint, but I also got way laid by the other shades on the same row of paint. 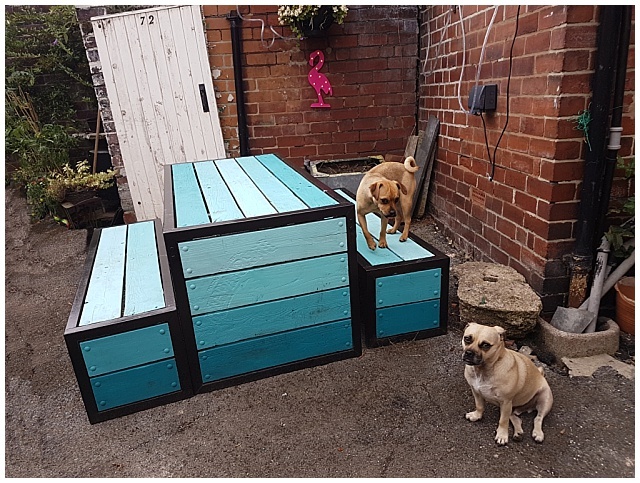 They aren’t actually available as wood paint, but they do come in masonry paint, and after chatting to the paint guy, I thought I’d give it a go. 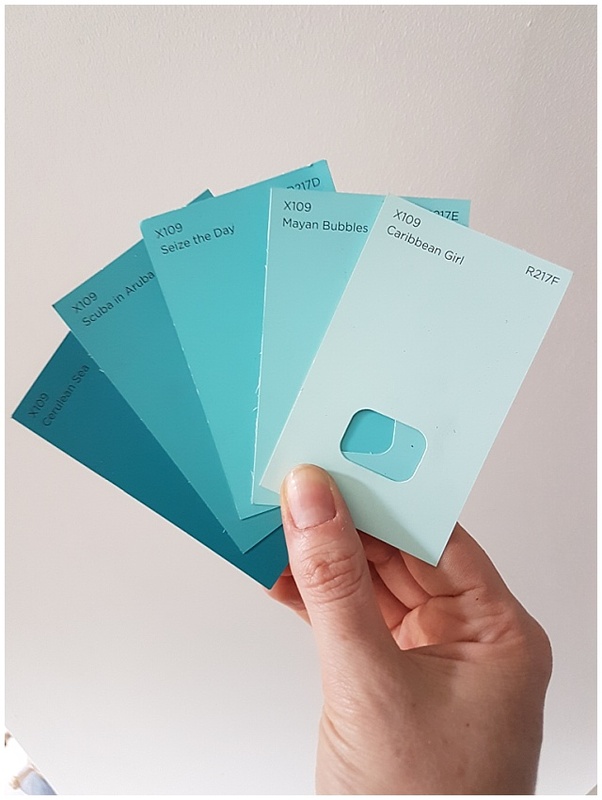 So I ended up leaving the shop with 5 different tester pots of paint, in a gradient of shades of turquoise - from light to dark - Cerulean Sea, Scuba in Aruba (anyone elses' brain go to a Friends episode here? ), Seize the Day, Mayan Bubbles and Caribbean Girl. The wood paint tester was £5 a pot, and the masonry paint testers were £2.50, so it’s a really cheap DIY (I also bought some really cheap, £3 a set, own brand brushes so that I could throw them away afterwards because I hate cleaning paint brushes). And well, you can see what I did with it can’t you! I only ended up using 4 of the shades as I thought the lightest one might be a bit too pale for a table outdoors. 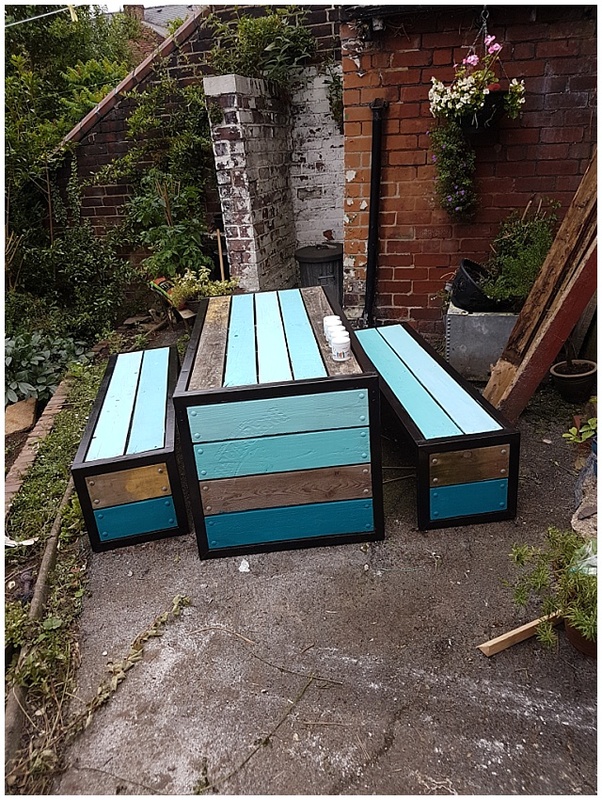 Starting with the darkest shade 'Cerulean Sea' (to combat the dust and dirt that will inevitably build up on the floor) I painted the slats on the sides of the table in the various shades. To guard the newly painted metal I slotted in ripped up bits of fliers that come through the door with the WI magazine (they finally came in useful!) but if I’d been more prepared I would have masking taped it just to stop the coloured paint ruining my handy work. 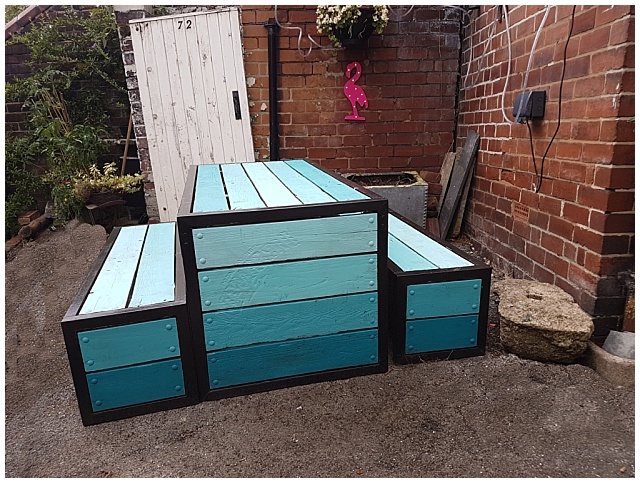 A couple of hours later, for less that £30, I had an ombre garden table in my favourite shades of turquoise. And I couldn’t be happier. I really love it. And Jim loves it. And it looks so much smarter than it did before I painted it. Now to see how the masonry paint holds up on wood. Now I just need to sort out the rest of this corner of the garden – I’m thinking of using the lightest paint 'Caribbean Girl' on the out house wall, just to keep up the theme, there are some hanging baskets to relocate now the fence is up, some lighting, a sail shade over the table and a built in BBQ in this 'patio' space (not much to do then! ).